(Self Control Quotes submitted by Ron Pfeiffer and Cornelius Matthews). A Special Thank You to our UWP Contacts Kelly and Dwight! "or What's been goin' on lately"
Tai Chi and Self Defense together at last! Tai Chi Students gettin' it on with "Single Whip"! Kateylnn and Angela showin' no fear! Black Belt Instructor Jeff Hansen takes one to the midsection! There are a few more pictures at www.dragonkenpo.net/demopics. We ended the day with the promised bribe... Ice Cream! Additionally I have been contracted with UWP to teach some self defense this month and again in Oct. The Oct stint will include a Tuesday evening self defense for all ages and a Saturday morning Intro to Tai Chi. The fun never ends!! Let me know if there is anything you'd like to see in the upcoming Slayer. It comes out on the 15th of each month. I've attached a copy of my self defense course for your review. (If you didn't get it email me) Basically, the techniques of white belt are introduced to the new student. We had our first class at the university last Wednesday, it was full! The students had a blast. Some seemed to enjoy helping their partner understand the "wristlock"! This week it was cancelled due to weather, freak snow storm. So it will be extended. And.... Yes there is more.... Here is a link to the "Tai Chi in the Park" program that will begin the first week of May. www.dragonkenpo.net/taichi.html It's a students intro to proper thinking to be successful in tai chi practice. As with any martial art so many times a students negative attitude will sabotage their efforts. This page make an attempt to counter this "American" (not exclusively) so to speak, thought process. The Tai Chi for Health Community sent a message asking for an update from me concerning what I was doing to spread the healthful practice of tai chi (guess they were checkin' up on me!!) and then asked if they could publish the email on their website! So if/when that happens I'll pass it along. As you can see I'm working diligently on the advancement of self defense and tai chi in our community as I hope this will inspire our members and our local students. Roger Sobrinski has been interested in the Martial Arts all his life, but only began his training about 2 years ago. He is currently a Green Belt in Freestyle Karate. He is a happily married father of three children. He has been very happy to bring his love for the Martial Arts to his 9 year old son, who is a Yellow Belt in Freestyle Karate. Roger is a White Belt in World Dragon Kenpo and working hard towards Yellow. He is a Correctional Officer with the state of Florida. He also was in the USMC. His greatest ambition is to learn both the styles he is currently studying to the level to open his own school. �One the greatest rewards in life would be to share my knowledge and love of the Martial Arts with the next generation.� He believes. Roger can be reached at rsobrinski@yahoo.com. "I found WDK while searching the web. I was immediately excited about what the program had to offer. Then when I saw what the tuition was. I was hooked. The defense techniques and ideas are similar to the style I am currently working in. I was also impressed with the amount of information provided. The videos are very easy to follow which makes the techniques easier to learn and practice. I hope this will be the beginning of a long and beneficial relationship with Coach Ron and the WDK. He is also a very approachable person, which is very helpful with an online program. I am also getting my son involved. He seem real excited about the training also. We really share our love for the Martial Arts. This program will be another way for us to bond and enjoy spending time together. Thanks again Coach Ron and the WDK family." Here are four World Dragon Kenpo Orange Belt techniques. Remember, as WDK North Carolina State Director Ed Dellacroce has advised, "It is better to practice one technique 1000 times, instead of 1000 techniques one time." Please begin each technique in the Dragon Kenpo ready position. Since the attacker throws a left punch, begin with your right hand to perform an inside outside block thrown against the elbow and lower left arm. Properly executed, the attacker will be positioned with his left side and back facing away from you. This posture enables you to perform the rest of the technique quickly and efficiently. 1. Step forward with your right foot, right hand to the attacker�s neck. 2. With your left hand, grab the front of the attacker�s neck. 3. Pull down the attacker swiftly as your right knee strikes his left kidney and lower back regions. Properly executed, the attacker�s neck is pulled over the top of your knee. 4. Return to the fighting stance. Remember to breathe whenever you kick or strike. We will use the left arm and wrist to block and trap the initial right lead punch. The purpose of this defense is to open the center line of the attacker for a quick counter-attack. 1. Using the left arm, execute an outside left block and trap of the attacker�s right wrist. 2. With your right leg, snap kick to the middle torso. 3. As the attacker bends slightly from the kick, grab his neck with your right hand. 4. Bring the head down as you execute a quick right knee lift. Secure the attacker�s left wrist with your left hand as you execute this move. 5. Return to the fighting stance. Remember to breathe whenever you kick or strike. The purpose of this defense is to quickly counter the initial lapel or collar hold before the attacker can secure you with more leverage. 1. Step out with your left foot as you use your right hand to reach around in a scooping block to grab the right bicep of your attacker. 2. Using a twin motion, pull the attacker towards you with your right hand. Execute a left hook punch into the ribs/kidney area, which should make the attacker bend backwards and move downward from the impact. 3. Follow up the motion with a left hook into the head of the attacker. 4. Flow into a left elbow strike to the side of attacker�s head. 5. Reverse the direction of your left arm, and execute a back elbow strike to the attacker�s face. 6. Quickly execute a back left fist to the attacker�s face. Step back with your right foot away from the attacker. As you can see, this technique emphasizes the left elbow and fist in a rapid sequence. 7. Return to the fighting stance. Remember to breathe whenever you kick or strike. The purpose of this defense is to counter with a double block and wrist trap to ultimately control the attacker with a come-along hold. 1. Execute an outside block and trap with your right hand, followed with an inside block with your left hand against the attacker�s right elbow and wrist. Your right hand traps the attacker�s right wrist. Step out with your left foot as you perform this sequence. This will position you behind the attacker. 2. Strike the attacker�s head with your left elbow. 3. Turn the attacker�s wrist with your right hand, slide your left hand down the attacker�s arm to grab the wrist, and then apply a come-along hold with your right hand. Properly executed, the attacker�s fingers will be facing him. 4. This is a control move to immobilize the attacker, lead him in another direction, or to wait for further assistance. Coach Ron Pfeiffer, a 5th Degree Black Belt in Dragon Kenpo Karate, reviewed this article. As Taught to the Students of Sensei Rich Miller, Sr.
By Sensei Rich Miller, Sr.
All techniques are most effective when the attacker cannot detect when they are being executed and where they are coming from! Don�t chamber them! Basic Geometry: The shortest distance between two points is a straight line. Body Movement: Shifting on the balls of your feet to pivot your body in the proper direction enhances the effectiveness immensely of all your blocks, hand, and elbow strikes. 1) Eye flick, eye gouge, palm heel, half fist, lead punch, out-to-in knife hand, ridge hand, and spear hand strikes. Shift your heels around so that your body pivots in the opposite direction of your striking hand, which extends your strike through your target. 2) Backhand, back fist and in-to-out knife hand strikes, shift your heels around so that you pivot in the same direction of your striking hand, extending your strike through your target. 3) Practice this method with all blocks, hand, forearm, and elbow strikes. Easy to figure out! You should bend your knees to lower your stance immediately whenever being attacked. Bend your knees while you�re in motion to counter-attack. Don�t bend then move! Study Bruce Lee�s Jeet Kune Do fighting stance. In my opinion, it is the best. When blocking a kick, hand or elbow strike, or grab pivot or step then pivot in the same direction as your block, shifting your weight to your back leg. If you miss the block, at least you moved out of the way. wrist block, a high inside block, a knife hand or hammer fist outside block or an oxjaw block. An attack to the side of your head when the attacker is striking with the hand opposite the side they are attacking can be deflected using a forearm block (elbow pointed upward). A downward attack to your head can be deflected using a rising head block or a cross block. An attack anywhere between your lower stomach up to your solar plexus can be deflected using a palm block or an out to in forearm block (elbow pointed upward). An attack to either side of the front of your ribs can be deflected using a middle body block. An attack anywhere between your collar bone and directly above your solar plexus can be deflected using an out to in forearm block (elbow pointed upward). Whenever possible, move towards the attacker and counter-attack while you are blocking. This methodology is more effective than stepping back from the attack and blocking, which gives the attacker more time for their next move or to detect your counter-attack. Circular blocks and blocks that implement displacement are very effective methods of gaining control. They also are very useful when blocking and striking with the same hand. Using your knee to block is a very effective method of stopping short distance kicks. Shifting your hips toward the direction of your kicks increases their effectiveness. The most effective kicks, and the hardest to block, are low kicks using your lead foot to the knee, shin or instep. Using the back foot (reverse kick) to kick takes longer to execute and allows the attacker time to detect your counter-attack. 1. Front kick - 45E to target. 2. Round kick - 90E to target. 4. Back kick - 45E away from target. Your body should be positioned approximately 45E to your target at the full extension for most hand strikes. Using the lead hand to strike is harder to detect than a reverse hand strike. When you pivot on your heels and turn your body so that it is positioned approximately 45E to your target, it positions the hand you are striking with closer to the attacker and creates a more penetrating and devastating strike. Whenever advancing, retreating or moving to the side move the foot closest to the direction your are going first, then shift your weight to that foot. Move the opposite foot in the same direction and hop the lead foot forward landing the opposite foot in the same spot the lead foot was or even farther in that direction. This concept is called displacement. Study Bruce Lee�s burning kicks for further review. Also, pushing in the direction of your movement with the ball of your back foot projects your movement faster. Practice this and experience how fast you can move to advance toward, retreat from or side-step an attack. Learn how to snap your body and shift around on your heels to enhance the effect of your blocks, hand strikes and kicks. Whenever executing an exercise or technique that does not require excess energy or inner strength breathe in and out your nose normally. Whenever lifting something heavy or executing an exercise or technique that requires excess energy or inner strength (Chi) breathe in your nose, narrow your throat, tighten your solar plexus muscle and force the air out or execute a power shout. These components are the items that I employ in what I consider my common sense methodology of instruction. All comments and suggestions are welcome. Send all responses to 1rmiller@comcast.net. most join the martial arts to obtain. It is the Black Belt. meaning that it is our first step into the world of the martial arts. but Sensei Long had a different perspective. the ranking system utilized by the dishonest to pad their credentials. sales practices to black belts for sale, no skill required. has now been cheapened. Its worth shattered by the dishonest. be expected to be people of character and service. put money in your own pocket or to serve your own ego. Instead of serving yourself, serve your students and your community. playing at a hobby a few hours each week? What Does Make Sense To All Who Care? There are more opinions on the many aspects of teaching and studying Martial Arts than almost any other available topic. As I read the letters and responses in the Dragon Kenpo forums, it has come to my attention that Martial Arts is a very interesting topic of discussion for a vast number of beginners, intermediates and experts. It does my heart well to see so many out there that care enough about expertise of instruction that is employed by the many different styles. This is a perfect example of why I enjoy teaching and why I have chosen Dragon Kenpo. Dragon Kenpo gives me the unique freedom to express what I have learned to the best of my ability, rather than limit my usefulness as an instructor by confining my teachings to one methodology that is set in stone and forbidden to be expanded. The methodology that I employ in my instruction of Martial Arts is something so unique and hardly ever found in today�s society that I have changed its name from "Common Sense" to "Rare Sense". Simplicity is a wonderful tool to use in explaining the complex components of executing any individual technique. If I need to explain to a student how to get from point A to point B, I believe there are only two ways to accomplish this difficult feat. Either I tell them to follow a straight line, show them how to follow a straight line or do both. We are so fortunate to have so many before us that have already laid the proper foundation, like the way Bruce Lee showed us how to effectively use our mind, body and inner strength and how to effectively counter, strike or manipulate an attacker. As instructors, we have the responsibility to guide our students down an unfamiliar path that begins with a void of knowledge and expertise, then is filled with many rewarding adventures and finally doesn�t end, but continues with a sense of inner peace and a thirst for greater knowledge. I have found that whenever I am asked to enter into a discussion about Martial Arts, especially my methodology of instruction, I have to ask "How much time do you have?" I am about to face an enemy that I can�t defeat. Time is hunting me down like a hungry dragon. I�m happy to have had another birthday. It means that I have survived another year of life. It also comes accompanied by the knowledge that I need surgery on my knee, and things aren�t healing as fast as they used to. Next year I turn fifty. Enter The Dragon. Time has begun to change my views towards unarmed self defense. Physically I am losing strength. This is causing me to go back and look at old training from my childhood. The kind of things a big strong man in his twenties and thirties doesn�t worry so much about. I am referring to those techniques which allow us to use an opponent�s strength against him. Bruce Lee referred to this as "cooperating with your opponent." Bruce Tegner called it the "going with principle." Whatever you call it; this concept is useful to anyone, young or old, who faces a stronger opponent. No matter how strong you are, fighting an emotionally disturbed or drugged person would be the fight of your life. Persons in this state are reported to have almost super human strength, and are frequently oblivious to pain. So let�s look at a few scenarios where a "going with" principle can be applied. A stronger opponent grabs you by the arm. He wants to pull you into a building or pull you into a car. You resist by pulling away. You know you cannot get away in this manner because it is a force against force technique and he is stronger. You are setting him up. In response to you pulling to get away, he pulls you even harder towards him. As he increases his pull on your arm you suddenly throw your strength and weight into the direction he is pulling. Direct all your force against his thumb. The combined power of his pull and your push will allow you to escape easily. If you are prone on your back and being straddled, you are in trouble. Your adversary is on top and about to pin your arms down with his legs. Then he can pound your face with his fist. Push up hard like you really want to push him off with the whole right side of your body. Invariably he will try to push you back down diverting more and more of his strength into pushing the right side of your body back down. You suddenly reverse your push to the left side. Barring unforeseen circumstances you will be able to roll your attacker off. It will not be your strength that makes it happen but his. This is what people mean when they speak of using an opponent�s strength against him. You are going with or cooperating with your opponent by getting him to direct his force in the direction you want to go. Allow me to give one more example. Let us say you want to apply a forward wrist lock. It doesn�t work right. Your opponent resist pushing his hand in the opposite direction you want it to go. Cooperate with him. Apply a reverse wrist lock. If you move fast, and have practiced your techniques his wrist will be locked quickly by his own force of motion and your knowledge of joint manipulation. It may not be the direction you planned originally but if he prefers a reverse wrist lock we can do that, right? Yes, I can feel the dragon of time breathing down my neck. I can�t stop it. That�s OK; I have Dragon Kenpo. Enter the Dragon. This is not to say that martial arts will protect an aging person from attack, or always allow a weaker person to over come a stronger person. On the other hand, it might keep me alive during the time it takes for help to arrive� And that�s all the time I�ll need! According to the American Heritage Dictionary self control means "control of one�s emotions, desires or actions by one�s own will." We are all familiar with the subject of self control in vocally expressing ourselves. From childhood we are taught to control our temper. Normally there were consequences for failing to heed such advice. With a concentrated effort self control can become a valuable asset to our own personal survival. How can you apply self control in a defense situation, and what are its benefits? Let�s start with the obvious. If you are out of control, you are not in control. This statement may sound too basic and almost make no sense at all. If you will stop and analyze the words you will discover the answer to the riddle. An emotional lack of self control stresses our body in many ways. In an attack situation, our bodies automatically initiate the fight or flight response. This primal instinct increases our heart and breathing rate. The process also drains us emotionally and physically with a surge of adrenaline. Our bodies do not sustain this heightened state of readiness, but rather become weakened afterward. Learning to regulate our emotions through self control can shorten the cycle. Martial artists who fight in competition may use meditation to release stress. It would take only one fight to realize emotional lack of self control physically deprives our body. Stress tightens our muscles, causing a decrease in normal blood flow. Our vision, mental reasoning, and co-ordination also show a decrease as the stress escalates. A focus on self control can help us to maintain an increased state of sustained readiness and endurance. The benefits are obvious. Executions of techniques are more precise and sound judgment replaces careless actions. This practice can be carried over into our normal day-to-day activities. A clear mind is able to rationalize, versus a confused mind reacts on thoughtless impulse. If you are faced with a stressful situation, if possible, take deep breaths. Focus of keeping your emotions under control. Mentally tell yourself to calm down and imagine the stress being drawn out of your body. Slow your respiration rate and replace rapid shallow breathing with slow deep full breathes. As concentration increases your blood vessels will begin to dilate. A deeper calmness will emerge. You will also regain a heightened state of awareness, a new direction and a rich satisfaction of your self initiated stress reducing techniques. Dragon Kenpo. Can you tell me a little more about your program? simply available for purchase? Will I need to purchase a number of DVD's? Will I find a number of "hidden fees"? Are all belt ranks awarded through video testing? Are there any weapons taught in your on-line course? Could my 10yr old son train with me and achieve rank? The answers follow your questions below. Then at the bottom I've included the standard letter that I send to all our inquiries. I found your website that offers membership for on-line training in Dragon Kenpo. Can you tell me a little more about your program? Are the training materials in the members area for use, or are they simply available for purchase? Will I need to purchase a number of DVD's? The training is available through our online school. You just login and begin your study. No DVD's to keep track of. Absolutely not. There are no hidden fees. All fees are fully disclosed to our members. The month student tuition is 9.95/mo. Certificates are viewable through the My Awards link and can be printed. Signed and sealed certificates can be ordered through the Online Store, for you or persons whom you may train in the future. Members may also order uniform patchs. Video testing is only required for promotion to Black Belt and above (the exam fee is $20). Color belt promotion is done by Time in Rank, which means students may request promotion after 90 days. Students may request promotion via video or in person exam, most choose Time in Rank. We have a video training program teaching Nunchaku. Yes. Your son would have his own membership and his tuition would only be $5/mo which would be added to your invoice. You would be responsible for his training and advancement. Since you would be assisting me in his training once you achieve Orange Belt you could request Assistant Instructor status with our School, World Dragon Kenpo Schools of Self Defense. I await your reply with anticipation. I am ready to get started in a training program, but I must first get through the selection process and find the right program. The following text is what I send out most of the time. We are located in Lake Geneva at the YMCA. Our virtual martial arts program serves members around the USA and in several different countries. Membership Information for Student/Instructor Members WDK. Thanks for your interest in our school, World Dragon Kenpo. Whether or not you're familiar with Dragon Kenpo Karate you will enjoy a true "school experience" if you elect to become a full member, through our virtual dojo secured members area. It would be an honor to introduce you as the newest member/instructor candidate of World Dragon Kenpo Schools of Self Defense. Here's a bit more information concerning our virtual school. Tuition is only $9.95/mo which makes our school the most affordable alternative for many of our members. Dragon Kenpo is a derivative of Parker kenpo. To describe the style some have called it "stand up grappling". Forms in our school are a personal choice of the member, that is, it's up to you if you choose to practice a set of forms. Many of our student/instructor members do use forms since they bring them with from previous training. Here at the YMCA in Lake Geneva Wisconsin we use TKD patterns. The first 8 techniques are "judo" in origin taught at the White Belt level. or visit www.dragonkenpo.us and click the Join link. Check the latest edition of our ezine for some interesting reading for persons interested in self defense at www.dragonkenpo.net/mar07slayer.html. Let me know if you have any other questions your past experience may qualify you for Advanced Standing which allows for more rapid advancement thru a couple of the lower rank levels. program. Now I have a few more questions after viewing the training site. belt requirements? If not, may I incorporate my own into our training? and patches allowed or required? rating, or should we add him on now? run down on belt order? I also want to thank you for creating this online training program. teach as well as train, not only in the arts but also in fitness. Your experience is similar to many in our program. It qualifies you for Advanced Standing. That means that you will be able to proceed through the first 3 training levels at your own pace. Currently your rank is listed as None. Once you complete your study of this level email me and I will advance your rank to White. At that time you will be studying Yellow Belt techniques and also will be able to view the Warm-up clips which are basic punching and kicking methods. Feel free to add your own methods to ours. This school is designed to include your past knowledge, not replace it. After you are familiar with those techniques email your promotion request and you will be advanced to Yellow Belt. As a Yellow Belt you will be studying Orange techniques. I suggest you give yourself a week or two with this level. Then you may again request promotion to Orange Belt and elevation to Assistant Instructor. You will be able to view all promotions and changes of status in My Awards. Let me know when you wish to add your son to the roster. He will progress a little differently. Beginning with his rank of None he will study White belt until your satisfied with his understanding.... There is no Time in Rank for any White Belt. After that first promotion there is a 90 day Time in Rank requirement to fulfill before future advancements. We recommend a standard black karate Gi, American Flag patch on the right sleeve. WDK uniform patches are available in the Online Store and go on the left side of the chest. With your permission I would like to use our emails in the next newsletter. It can be anonymous if you wish. Also consider drafting a letter of introduction to the members of your new school. It's not required but it is a good way to let others know that you're serious and want to be involved. Self Control in martial arts can mean many different things since it affects us individually. The element of control should be taught early in any martial art system. This is taught through practice or repetition which can also be labeled learned behavior. Through this practice, the karateka learns to control their physical, emotional, and mental self, hence they learn to build confidence and maintain self control. Even further, the student learns self-control by practicing techniques with his or her partner(s). Through respect or discipline, the student can strike with light or no contact with his sparring partner, thus controlling his physical power. In another example, the student can get involved in an emotional, high stress situation that could result in a physical altercation. As a trained martial artist, he should have learned self control and not succumb to childish or taunting type behavior. This learned self control is also known as will or willpower to resist an emotional aggravating situation with physical force. Overall, martial art training develops and enhances skill sets within the student to give him or her awareness of their body, mind, and spirit. In sum, the student learns how their body functions and how to control it. Therefore, self-control is emulated through emotions, desires or actions by a person�s will to do or not do. When I think of self-control, one name comes to mind. Although he was a multi-sport athlete at UCLA, to the best of my knowledge, he never practiced the martial arts. But he practiced the art of self-control to a degree that few, before or since, could ever replicate. On 15 April 1947, Jack Roosevelt Robinson broke the color line in Major League Baseball. He had to promise Branch Rickey, the owner of the Brooklyn Dodgers, that he would never retaliate against the verbal and physical abuse that he would receive during his first year. Robinson was a proud man and fierce competitor; however, he embraced a challenge that few men would have ever taken. He maintained his physical and mental composure as a true champion. In our increasingly thin-skinned society, where perceived insults end up as criminal statistics, we need to be reminded about the tremendous example of Jackie Robinson. A great warrior only fights great battles. Or doesn't fight at all. In 1997, on the 50th anniversary of the historic event, Major League Baseball issued a decree. No player would ever wear #42 again. 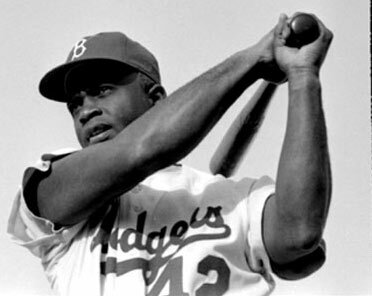 Jackie Robinson's famous number was retired to commemorate his great achievement. The next time that you are confronted with a situation where you may have to use your Dragon Kenpo training, remember to trust your instincts. Stay calm, focus your energies, and maintain control of self. Because like Jackie Robinson, until we learn to control ourselves, we can not control someone else. Learn from an example of excellence. Steve Amoia is a freelance writer. He joined WDK in 2005, and is currently a 3rd Degree Brown Belt. But he aims higher and continues to study self-defense, along with the recommended Tai Chi training. Steve has published articles and book reviews about alternative health, career-related themes, international soccer, martial arts, and sport topics. He is the historical editor for the Frederick Douglass Blog (http://www.frederickdouglassblog.com.) His email address is info@sanstefano.com. Rick Collette is currently the Arizona State Director for World Dragon Kenpo and a 1st Degree Black Belt in Tucson, AZ. Student of Kajukenbo and other arts. Email: rcollet@gmail.com. Ed Dellacroce, began his martial art journey in 1979 with Shaolin Kempo. Currently, he holds a 2nd Degree Black Belt in Dragon Kenpo. Ed teaches a self defense street version at ABI's Mixed Martial Arts Studio in Goldsboro, NC. Currently working as a Police officer for the State of NC, and working police and protection for the NC General Assembly. You can contact him at 1ncpaisano@bellsouth.net.